A singer and a dancer compete for the affections and services of a woman they want as their partner. Directed by Mark Sandrich, "Holiday Inn" is a musical comedy about two men who regularly battle for the affection of the same woman. It stars Bing Crosby as Jim Hardy, a singer who is tired of being on the road 365 days a year. He buys a farm in the hopes of a simpler life and is expecting his fiance Lila, played by Virginia Dale, to join him. She, however, has other plans, which involve staying with Jim's soon-to-be former partner Ted Hanover, played by Fred Astaire, whom she has been having an affair with, and so they can continue working together. Jim shakes off the betrayal and heads up to his farm, but finds the work far more taxing than he expected. He decides to convert his farm into an inn that is only open on holidays. He plans to perform there and hires a singer/dancer named Linda Mason, played by Marjorie Reynolds, who soon becomes his fiance. Things are going swimmingly until Ted shows back up again looking to recruit Jim's fiance for his act and steal her away for himself. This is often listed as a Christmas movie, which is why we watched it during this holiday's marathon. However, this is more of a 'holiday in general' movie. Though it does begin and end on Christmas, it also covers New Years Eve, Valentine's day, Lincoln's Birthday, Washington's Birthday, Easter, Independence Day, and Thanksgiving. Jim's Holiday Inn has a special performance each holiday, including a performance of a song titled "Abraham" with Bing, Marjorie and all the back up performers in blackface. In 2016, needless to say, it's extremely jarring to be poking along a film's run time and all of a sudden, BAM!, minstrel show, but we guess those were the times???? (Not to excuse it...it's still pretty jarring within the plot as well and brings the movie to a screeching halt). Still, it does certainly date the film to have a sincere blackface performance that goes on for far too long. 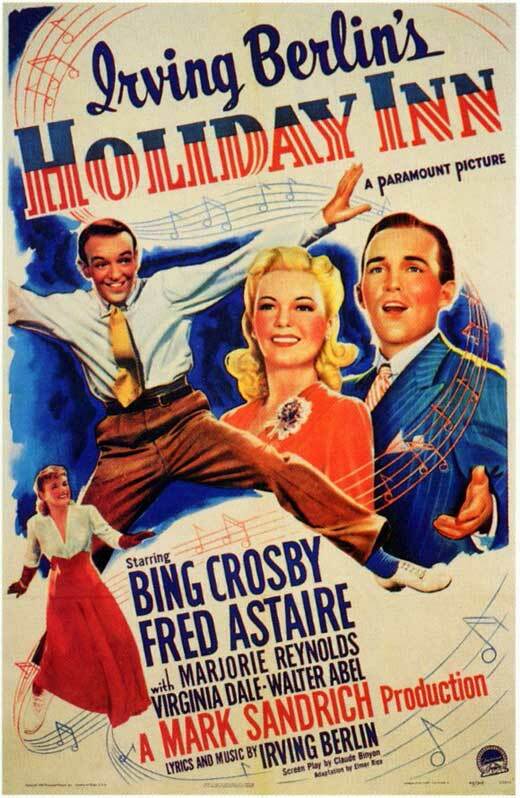 At its core, "Holiday Inn" is really little more than a series of song and dance numbers strung together with a loosely constructed love triangle to fill in the gaps. None of the relationships seem all that genuine. It's almost laughable with how easily these women switch fiancés on a whim, and how quickly the men fall in love with any woman who makes a halfway decent performance partner. Jim also gets over being betrayed by his friend on multiple occasions very, very quickly because real life! In this world, it doesn't seem possible to have a song and dance partner without them being a romantic interest. As we mentioned, "Holiday Inn" covers a vast time span of holidays, so the Christmas segments are kept short to make room for everything else. This movie is more about the singing and dancing, though, and those performances are entertaining for the most part. It's always fun to watch Fred Astaire, Virginia Dale, Marjorie Reynolds, and Bing Crosby do their thing. We know some readers will call us "triggered" for mentioning the blackface performance, but we have to be honest, it was extremely jarring to see from a movie in 1942. Last Christmas, we were watching: "The Santa Clause 2"
Two Christmases ago, we were watching: "Fred Claus"
Three Christmases ago, we were watching: "Home Alone 2: Lost in New York"